Adam Levine has little doubt about what he’d do if he were president of the United States for a day. “First I’d make gay marriage legal, because that’s just archaic and ridiculous,” the Maroon 5 hunk told MTV during an appearance with bandmate James Valentine. 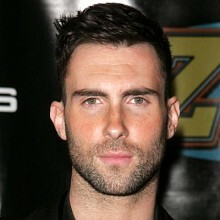 The singer, whose chiseled looks and smash songs like “Moves Like Jagger” and “Payphone” have made him a favorite of the gay community, also has family ties—his brother, Michael, is openly gay. Posted July 4th, 2012 & filed under News.